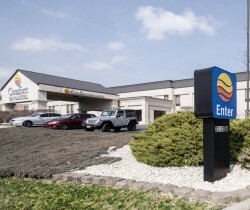 Located of I95, the smoke-free Comfort In & Suites is located near Aberdeen Proving Ground with easy access to Ripken Stadium and Cedar Lane Park. Amenities include: Free breakfast, business center, bus parking, cable/satellite TV, Free Hi-Speed wireless Internet, Free local calls, heated indoor pool and exercise room. Access to guest laundry facilities.